"President Donald J. Trump continued the time-honored White House tradition of officially pardoning the National Thanksgiving Turkey. This year’s candidates for National Thanksgiving Turkey were Peas and Carrots! After the votes were tallied, Peas earned the honor of 2018 National Thanksgiving Turkey. Peas and Carrots traveled to our Nation’s capital all the way from South Dakota! They were raised on a farm near Huron, S.D., under the supervision of National Turkey Federation Chairman Jeff Sveen and by turkey grower Ruben Waldner. The Presidential Flock of 50 turkeys was hatched in July, and Peas and Carrots were selected to travel to Washington, D.C."
"AAA: Thanksgiving travel will hit 13-year high"
"Brace yourselves. This Thanksgiving, 54.3 million people will travel 50 miles or more away from home, a 4.8 percent increase over last year. That will be the highest volume of Thanksgiving travelers since 2005, with an additional 2.5 million people taking to the nation’s roads, skies, rails and waterways compared with last year, according to an analysis by AAA. Most of those – 48.5 million – will drive to their destinations, a 5 percent increase over last year, says INRIX, a global mobility analytics company. Though gas prices have plunged in recent weeks, drivers will still be paying the highest Thanksgiving weekend gas prices in three years, says AAA. Even so, travel times in the most congested cities could be four times longer than a normal trip. The Thanksgiving holiday period is defined as Wednesday, Nov. 21 to Sunday, Nov. 25." The good news is that we don't have any major storms impacting the Eastern US this year, so travel "misery" should be kept at a minimum. However, a storm system moving in along the West Coast with heavy rain and mountain snow could cause some issues there. The storm is them expected to move across the Central and Eastern US as we head through the weekend and early next week, which could cause some travel issues on the way home from Grandma's house this year... Stay tuned! "Macy’s Thanksgiving Day Parade: High Winds May Ground Balloons"
"CBS2’s Chief Weathercaster Lonnie Quinn explains we’re in for the possibility of record-breaking cold Thanksgiving morning, with winds that just might force the parade balloons to be grounded. The wind gusts are expected to be right at the threshold for flying balloons: sustained winds at 22 mph and gusts expected at 33 mph. Balloons are grounded when sustained winds hit 23 mph with gusts of 34 mph. 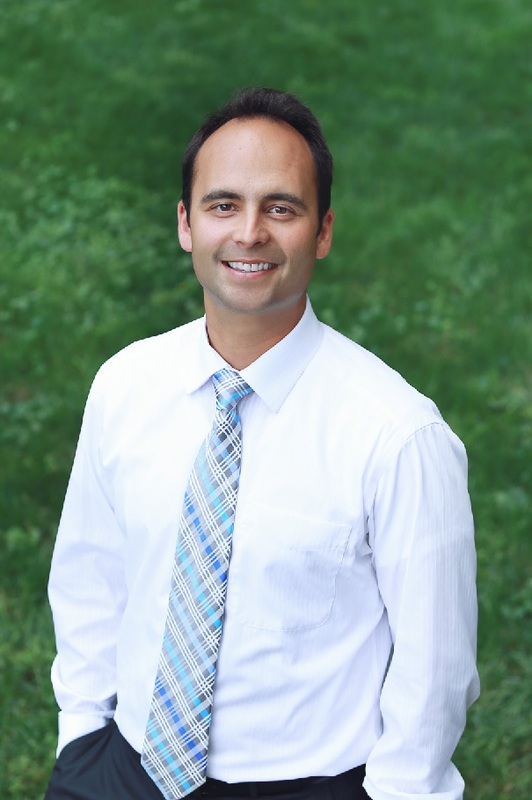 “We are right there,” Quinn said. “Can you even imagine a Thanksgiving parade without the balloons?” Safety measures for balloon handling were implemented after a handful of spectators were injured due to balloons hitting things and sending debris into the crowd. It’s going to be very, very cold. An arctic air mass will drop in, sweeping across the northeast with some of the coldest air for Thanksgiving ever recorded. Temperatures in New York CIty are expected to be around 22 degrees at the start of the parade, but with the wind chill, it will feel like 5 degrees. “Thursday morning is really going to be the worst of it,” said CBS2 meteorologist John Elliott. The last time the parade was canceled was in 1971, due to high winds and heavy rains." Here's a look at the weather across the country for the Thanksgiving Day holiday this year. Note that the eastern two-thirds of the nation look pretty quite (other than cold and windy weather in the Northeast). In fact, it could be the COLDEST Macy's Thanksgiving Day Parade on record and with windy weather, those famous giant balloons could be grounded - OH NO! The most active weather across the country will be found in the Western US with areas of heavy Pacific moisture rolling in. Areas of heavy rain could lead to flash flooding, especially in burn scar areas of the recent California wildfires. There will also be areas of heavy mountain snow through the end of the week, which could add up to nearly 2ft. in some areas across the Sierra Nevada Range. High temps on Thanksgiving Day will be EXTREMELY cold in the Northeast with some locations nearly -20F to -30F below average! Meanwhile, temps along the Front Range of the Rockies will be fairly mild for this time of the year with temps running nearly 10F above average! 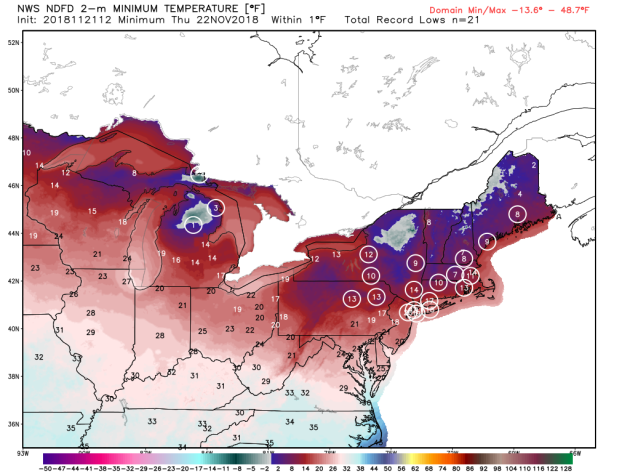 A number of folks in the Northeast could wake up to record low temps as they put the bird in the overn on Thursday morning! Some areas will even be down in the single digits above and below zero! Factor in the strong wind gusts here and it'll feel even colder - good grief! "Historically, about one in three Thanksgivings have at least one inch of snow on the ground. 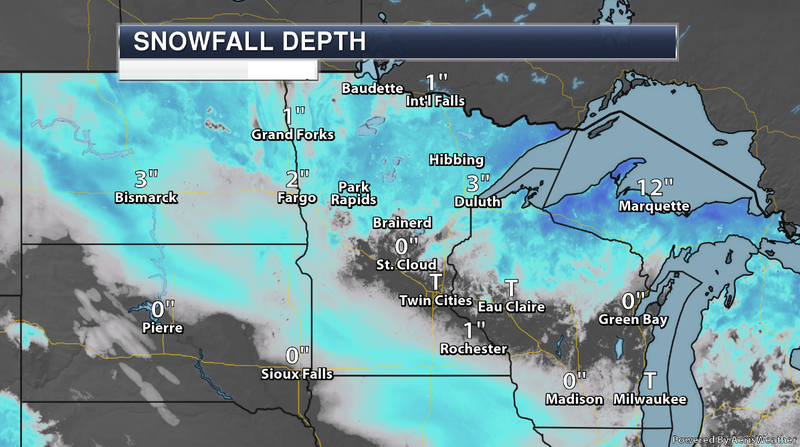 The deepest snow pack is a tie with 1921 and 1983, both with 10 inches on the ground by Turkey Day. Because Thanksgiving Day occurs at the transition period between autumn and winter, Thanksgiving weather can be balmy to brutal. A typical Thanksgiving Day in the Twin Cities has high temperatures in the 30's and at least a bit of filtered sunshine. Having a mild day in the 50's on Thanksgiving Day is relatively rare, looking at the historical record back to 1872. A maximum of 50 or more has happened only eleven times in 144 years, or about once every 13 years or so. The warmest Thanksgiving Day is a tie of 62 degrees in 1914 and 1922. The mildest recent Thanksgiving Day was 60 degrees on November 22, 2012. 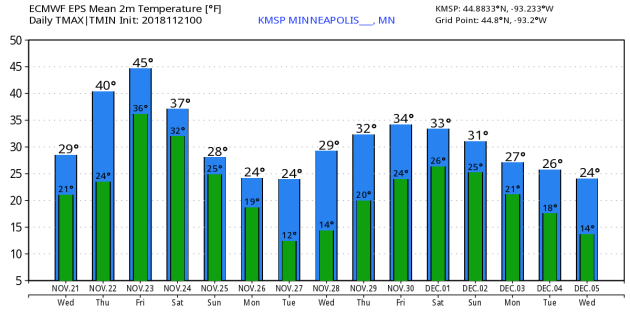 This tied 1939 as the third warmest Thanksgiving back to 1872 for the Twin Cities." High temps on Thursday will be warmer than it has been as of late, especially across far southwestern MN, where temps could near 50F!! 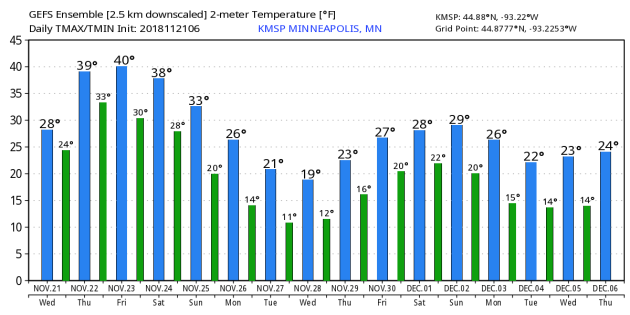 Folks in the Twin Cities will warm into the mid 30s, which will still be a tad cooler than average, but folks in the Arrowhead will still be nearly -10F below average. Temperatures in the metro have been running nearly -8F below average so far this month, but reading could warm to above average levels for a change as we approach the weekend. That will sure feel nice!! Enjoy it because the extended outlook into the middle part of next week suggests another fresh batch of cold Canadian air moving in with highs only warming into the 10s and 20s - BRR!! According to the European Model (ECMWF), areas of heavy snow could fall across parts of the Midwest late weekend/early next weekend. Exact details are still yet unknown, however, this model is suggesting nearly a foot of snow from near Des Moines, IA to Madison, WI. Stay tuned. We have so much to be thankful for. Growing up in what was East Germany, my 88-year old father survived both Hitler and Stalin. "There are a few billion people around the world who would probably give anything to have your worst day" he told me. I suspect he's right. I'm thankful to live in a progressive, optimistic state where many try to live up to "Minnesota Nice". I'm thankful for clean air and drinking water - for a perfect balance of urban culture and open land and lakes. I'm thankful for bug-killing cold fronts - and a lack of raging wildfires, quakes and storms with names. The mercury finally mellows a few notches today, as winds pick up from the southeast. Mid-40s will feel pretty good tomorrow, with light rain streaking in later in the day. It chills down again over the weekend; a fresh pulse of invigorating Canadian air whipping up a snowstorm just to our south Sunday and Monday. ECMWF hints at 6-12 inches from Des Moines to Madison and Milwaukee. Getting home may be rough 3-6 hours south/east of MSP. That said, wishing you and yours a blessed Thanksgiving. THANKSGIVING DAY: Mostly cloudy and breezy. Winds: SE10-15. High: 40. THURSDAY NIGHT: Mostly cloudy and quiet. Winds: SSE 10mph. Low: 38. BLACK FRIDAY: Light rain likely PM hours. Winds: S 10-20. High: 40. SATURDAY: Mostly cloudy. Drying out. Winds: NW 8-13. Wake-up: 32. High: 38. SUNDAY: Cloudy. Snowstorm should stay south. Winds: N 10-15. Wake-up: 28. High: 32. MONDAY: Mostly gray. WC in the teens. Winds: NW 10-15. Wake-up: 18. High: 27. TUESDAY: More sunshine. Still chilly. Winds: W 7-12. Wake-up: 12. High: 26. WEDNESDAY: Clouds increase. Light snow late. Winds: SE 8-13. Wake-up: 11. High: 30. 1996: Heavy snowfall accumulates over the same areas that were hit two days earlier. Four to seven inches of snowfall are reported across the area. Heavier snowfall occurred during the daylight hours of the 23rd. Snowfall totals of six inches were reported in the Twin Cities, Chanhassen, Stewart, St. James and Redwood Falls. 1970: Gale-driven snow falls across Minnesota. 45 mph winds are reported over Rochester and Duluth. 1.) 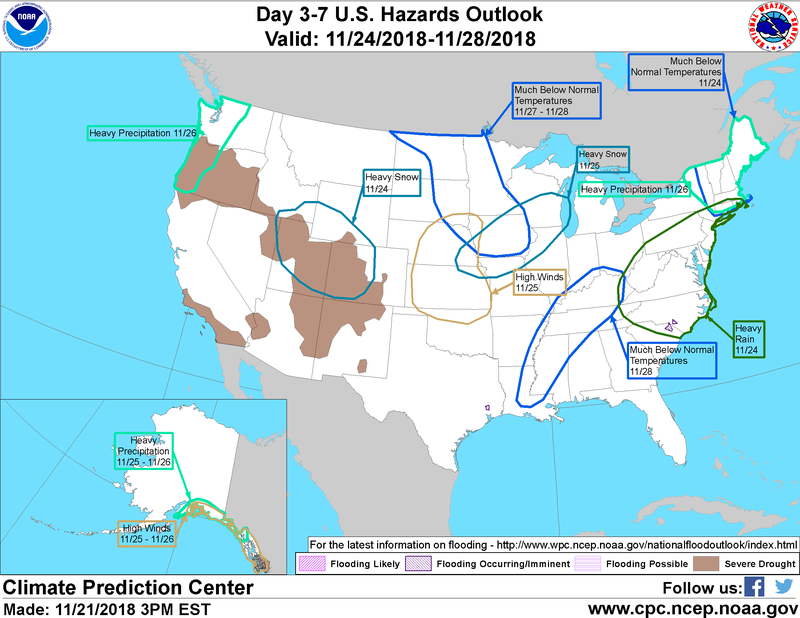 Heavy precipitation across portions of California, the Great Lakes, the Northeast, the Pacific Northwest, and the Northern Great Basin, Mon, Nov 26. 2.) Heavy rain across portions of the Northeast and the Mid-Atlantic, Sat, Nov 24. 3.) Heavy snow across portions of the Central Plains, the Central Great Basin, the Northern Plains, the Northern Rockies, the Central Rockies, and the Northern Great Basin, Sat, Nov 24. 4.) 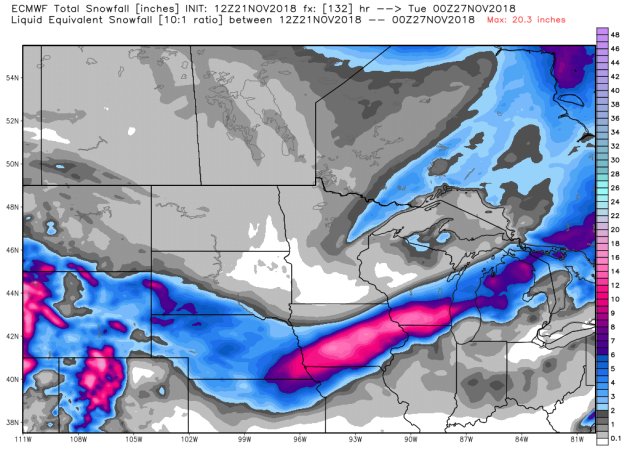 Heavy snow across portions of the Central Plains, the Middle Mississippi Valley, the Great Lakes, and the Upper Mississippi Valley, Sun, Nov 25. 5.) Flooding occurring or imminent across portions of the Southeast, the Mid-Atlantic, and the Southern Plains. 6.) High winds across much of Nebraska and Kansas, northern Oklahoma and southern South Dakota, Sun, Nov 25. 7.) Much below normal temperatures across portions of the Northern and Central Plains, and the Mississippi Valley, Tue-Wed, Nov 27-Nov 28. 8.) Much below normal temperatures across portions of the Southeast, the Middle Mississippi Valley, the Lower Mississippi Valley, the Ohio Valley, and the Tennessee Valley, Wed, Nov 28. 9.) Much below normal temperatures across portions of the Northeast, Sat, Nov 24. 10.) Heavy precipitation across portions of the Alaska Panhandle and mainland Alaska, Sun-Mon, Nov 25-Nov 26. 11.) High winds across portions of the Alaska Panhandle and mainland Alaska, Sun-Mon, Nov 25-Nov 26. 12.) Slight risk of much below normal temperatures for portions of the Southeast and mid-Atlantic, Thu-Fri, Nov 29-Nov 30. 13.) Slight risk of heavy precipitation for portions of California and the Pacific Northwest, Thu-Mon, Nov 29-Dec 3. 14.) Slight risk of heavy precipitation for portions of the Southeast and mid-Atlantic, Fri-Mon, Nov 30-Dec 3. 15.) Slight risk of heavy precipitation for portions of the Alaska Panhandle and mainland Alaska, Thu-Sun, Nov 29-Dec 2. 16.) Moderate risk of heavy precipitation for portions of the Alaska Panhandle and mainland Alaska, Thu-Sun, Nov 29-Dec 2. 17.) Severe Drought across the Central Plains, the Central Rockies, the Central Great Basin, the Southern Plains, the Northern Great Basin, the Southern Rockies, California, the Alaska Panhandle, the Pacific Northwest, and the Southwest. Thumbing Our Nose at Old Man Winter - Thanksgiving Thaw - Snow Risk South/East of Minnesota Early Next Week?